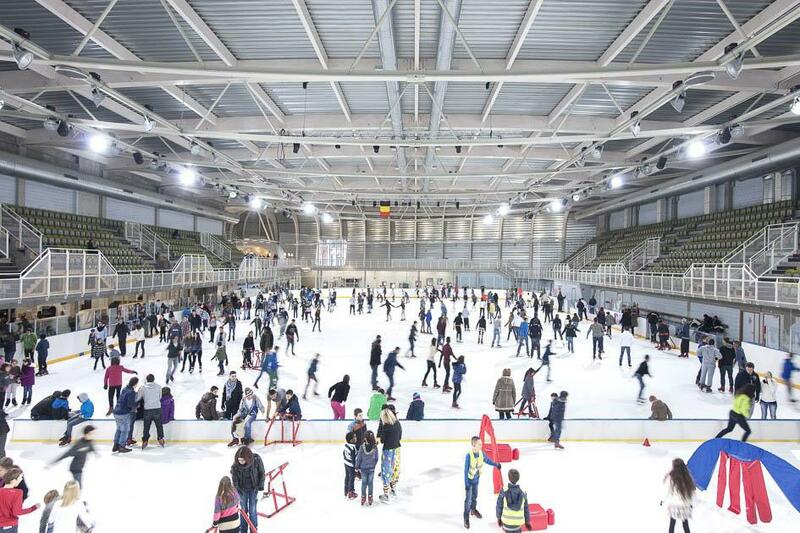 An ultramodern new ice sports centre complete with a skating rink that can be converted into an ice hockey rink has been built on the banks of the River Maas near the Médiacité shopping mall in the Longdoz district of Liège in Belgium. The complex, an architectural masterpiece created by L’Escaut Architectures from Brus- sels (www.escaut.org) in cooperation with Bureau Études Weinand in Liège (www.weinand.be), houses an Olympic size rink with seating for 1250 spectators durinig matches and 500 ska-ters can use the ice rink simultaneously during leisure time. A characteristic feature of the building is the curved form of the roof structure. Even though Escaut/Weinand, who won the tender for this project in 2007, initially thought of designing the ice sports centre in the shape of an ice cube, gradual changes in the design approach meant that the buid-ing as it was finally constructed looks like a whale. This futuristic building, erected in a redeveloped industry park in Liège, was opened at the end of 2012. It meets the most stringent requirements in the fields of acoustics, thermal insulation and fire safety. “We have used also innovative meterials,” David Crambert goes on. “The façade is provided with 200,000 scales, like the scales of a fish, which we had specially made by a manufacturer for this project. The scales form a protective outer layer to ward off external climatic effects, and are themselves provi-ded with a protective finish. The scales are made of aluminium.The opacity of the building is essential for thermal insulation, while its shape and the choice of materials help to create the desired relationship with the surroundings. The main entrance faces on to the shopping mall, and blends in with the multitu-de of stores located there, while the secondary entrance, facing on to the service street at the back of the mall, boosts the urban value of this dead end. 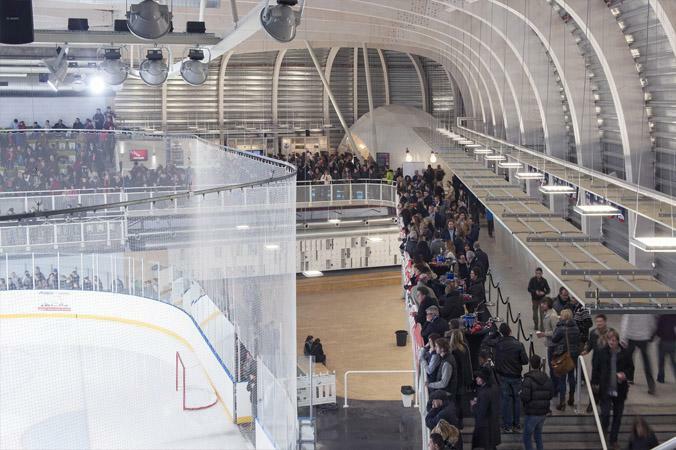 The building, like a huge whale stranded on a beach dedicated to consumerism, attracts the public with its shimmering metal skin and bright white interior to participate in the skating events either as spectators or as players.” Visitors have a splendid view of the rink from the first floor. The main access to the mall’s car park is via the ‘head’ of the whale, which also serves as a landmark drawing the attention of passers-by to the rink. This dome is the most highly curved and spectacular part of the façade, where the pattern of the scales is most clearly visible. Cars drive down the ramp into the car park. This massive structure reminiscent of the ’70s reminds us of the glorious past of Liège, when the car was queen in town planning and in some architectural projects such as the Simenon residence with its own petrol station and the Belvedere residence with the car ramp built into the architectural de-sign. Cars are no longer so welcome today, though they are still omnipresent in the city. Why should we deny this? Let us honour it by recreating the atmosphere of New York of the ’20s and its “diners”. 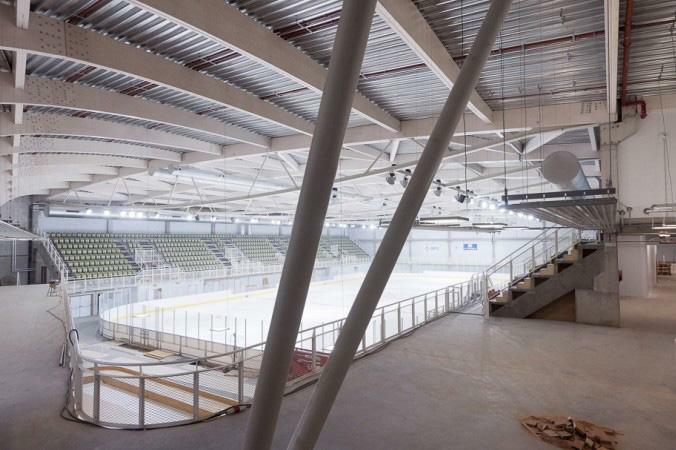 The interior of the ice rink focuses on the heart of the matter: functionality, economy and entertainment. A 1000 lux flood of light at the entrance to the ice rink in the Médiacité shopping mall points the way to the world of ice. Once past the airlock chamber, we dive into the interior of the ice sports centre, where the ambient temperature is maintained at 16° C all year round. Upon arrival in the foyer, the ice rink and the whole interior of the building is visible through as metal mesh wall. Here you can sometimes asee people skating for pleasure, and at other times admire ice hockey teams or figure skaters at their practice. The skating area is directly accessible from the foyer. You can hire skates here, pull them on and are then ready to venture out on to the ice. The “wood room”, adjacent to the rink, is a recreation room with a solid oak floor. Visitors can walk along the metal wall to the stairs at the end, leading up to the first-floor cafeteria. On the way, they can view the inner workings of the skate store through the mesh of the wall, with skates hanging up to dry or being sharpened. 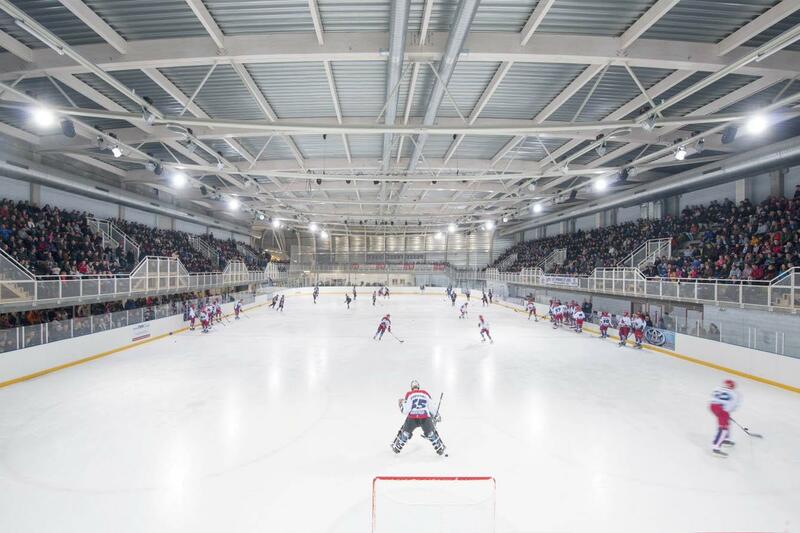 The atmosphere of the interior enhances the enjoyment of the skaters, players, spectators and other visitors - but an equally important contribution is made by the climatic performance of the structure as a whole, with its outer shell designed for an insulation factor of K22 (equivalent to that of a normal house); 2 refrigeration units developing 1000kW coupled with 4 sets of air coolers; and a ventilation system with a flow rate of 60,000 m3/h to dehumidify the air above the rink. Eighty spot-lights ensure uniform 1200 lux lighting during matches and competitions, which is particularly important when these events are broadcast. Formidable engineering was necessary to allow this sea monster to perform at the desired high level while still permitting maximum reuse of energy; a heat pump, ventilation system and hot water tank recover part of the heat produced by the refrigeration units.